The SIA Door Supervisor Licence allows the holder to legally work as a Door Supervisor or Security Guard in the United Kingdom. What is the Door Supervisor Licence? The Door Supervisor Licence allows holders to work in the private security industry in a variety of roles. The licence is issued by the Security Industry Authority (SIA) and is valid for 3 years. With the SIA Door Supervisor Licence individuals can work in pubs, bars, shops, malls, office buildings and more. Primary responsibilities include keeping the public safe from harm and protecting private property. Do I need an SIA Door Supervisor Licence? If you are conducting the licensable activities of a Door Supervisor, such as protecting private property or members of the public, then by law you require an SIA Licence. In certain circumstances, however, your employer may have been given an exemption under Section 4(4) of the Private Security Industry Act 2001. Working in the private security industry without the appropriate SIA Licence is a legal offence with severe penalties. To be eligible for an SIA Door Supervisor Licence, you must be 18 years of age, have the right to work in the UK and have passed the Door Supervisor Course. You will also have to pass identity and criminal background checks conducted by the SIA. The Door Supervisor Course takes 4 days to complete. The training course is assessed by 3 multiple choice exams and a practical assessment. The cost of starting a licence application is £220. The SIA will get back to you within 25 working days. In rare cases, this can take up to 6 weeks. You will need to verify your identity to satisfy parts of your SIA application, namely your photo ID. The easiest way to do this is at the Post Office. You can also have someone with a British passport, who is not related to you, to sign the back of your photo ID. The SIA will verify your identity and run a background check on your criminal record. If you have lived abroad for 6 months or more, you may be required to provide some supporting evidence. You are finally licensed! Your SIA Door Supervisor Licence is valid for 3 years. To apply for the Door Supervisor Licence, the SIA requires you to complete formal training and pass the assessment. The course is assesed by 3 multiple choice exams and a practical exam. These will be held on the last day and will test your knowledge of the content taught during the course. 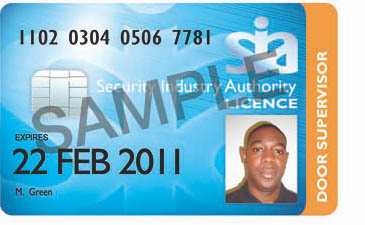 The SIA Door Supervisor Licence costs £220 and the licence is valid for three years. The fee covers the cost of processing your application and is non-refundable. For further information, please refer to the Official SIA Website. Renewing your SIA Door Supervisor Licence is normally quite straightforward, but in some cases requires extra refresher training. This all depends on when you received your qualification. Your qualification was awarded after September 2010. Your qualification certificate says "[Awarding body name] Level 2 Award in Door Supervision (QCF)". Your qualification was awarded before June 2010. Your qualification was awarded between June and September 2010, and your training course did not include a module for Physical Intervention Skills. If you require the extra refresher training, you will need to pass the 'Up-Skilling for Door Supervisors' award before you can renew your licence. This course is available at our training providers who offer the licence-linked door supervision qualification. Finally, you can start renewing your current SIA Door Supervisor Licence 4 months before it is due to expire. The new licence will commence only after your current licence has expired. The application cost is a non-refundable £220. For some licences, the SIA permits individuals who meet one licensing criterion to carry out related licensable activities. For example, if you have a Close Protection Licence, the SIA allows you to use your licence to work as a Door Supervisor. In the same way, individuals who have a Door Supervisor Licence can work as Security Guards, CCTV Operators, and key holders. Learn more about SIA licensing integration. Q. What is the cost of the SIA Door Supervisor Licence? The SIA Door Supervisor Licence costs a non-refundable £220. This is paid directly to SIA, who are the licensing authority for the security industry. Q. How long is my SIA Licence valid for? Your SIA Door Supervisor Licence is valid for 3 years. Once it expires, you can simply take a refresher course and re-apply for it. Q. Am I eligible for the SIA Door Supervisor Licence? Q. What is the Door Supervisor Course and how long does it take? The Door Supervisor Course introduces you to the fundamentals of working in the security industry. It runs over 4 days and is a requirement for obtaining the SIA Door Supervisor Licence. By the end of the course you will achieve the Level 2 Award for working as a Door Supervisor within the Private Security Industry. Q. What does the SIA check when applying for a Door Supervisor licence? The SIA checks the criminal background of applicants through a DBS check, as well as verifying their identity. Q. Will having a criminal record affect my SIA application? Having a criminal record does not prevent you from obtaining an SIA Licence, but this does depend on the type of offence and SIA. It is best to contact the SIA directly if you are considering applying for a licence. It is worth noting that the £220 licence application fee is non-refundable. Q. How long does it take SIA to process a licence application? According to the SIA website, it takes 25 working days to process a licence application. In some cases, this can take up to 6 weeks due to additional security checks. Q. What kind of work can I do with the SIA Door Supervisor Licence? The SIA Door Supervisor Licence enables you to work in the private security industry. Places you can work include pubs, bars, shops, malls and office buildings. Q. Can I work in the security industry without an SIA Licence? It is illegal to work in the security industry without an SIA Licence. However, some employers can qualify for exemptions under Section 4(4) of the Private Security Industry Act 2001. Q. What is the difference between the SIA Door Supervisor Licence and Security Guarding Licence? Although very similar, the SIA Guarding Licence restricts you from working in certain environments such as at licensed premises where alcohol is served. The SIA Door Supervisor Licence, on the other hand, does not have this type of restriction and gives you greater access to employment opportunities. Moreover, it is also easier to renew your SIA Licence as a Door Supervisor once it expires after 3 years. To give you the best chance with your career, Get Licensed recommends the Door Supervisor Licence. Q. What is Licence Integration? Licence Integration is where an SIA licence that is for one licensable activity can be used for another licensable area. For example, if you have a Close Protection Licence, the SIA allows you to use your licence to work as a Door Supervisor. To read our full list of FAQ's, click here.